I wanted to start a discussion about little issues that come up with Sawstop tablesaws and tips and tricks to make the tool easier to use and adjust. 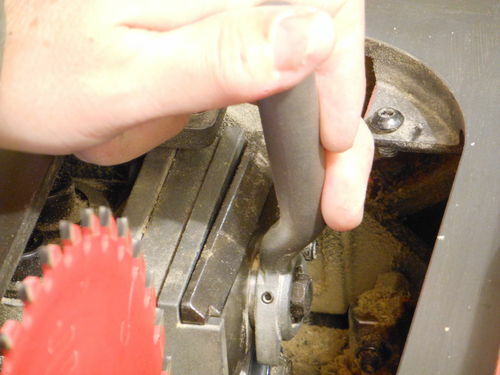 Whether it’s just becoming familiar with a new saw and refreshing your memory from the Sawstop manual, or coming up with something new, this is the place to share it. Recently I was ripping with my PCS using a thin kerf blade and a 2.3mm riving knife. The setup worked fine for a while, then the riving knife started hanging up on the workpiece. It surprised me a little, because I wasn’t even working with hardwood, just ripping some finish plywood. I might expect springy hardwood to bind every now and then, but this was different. So I checked the kerf on my Freud LU86 thin kerf blade, and it was .091”. I had been using the black Sawstop riving knife that is labeled 2.3mm thick. 2.3mm = .09055” so it is technically thinner than my blade kerf, but not by much. I found a 2.0mm riving knife on Sawstop.com, but it wasn’t listed as being compatible with the PCS. I called Sawstop and they do offer the 2.0mm riving knife, and it fits the PCS just fine. It is not on the compatibility list because the PCS ships with the 2.3mm riving knife. The hole pattern on the two riving knives is identical. When I swapped out the riving knife from the black to the chrome, the clamping action was a little loose. To adjust the tension of the riving knife clamp, push the clamp handle over to the left. This exposes the adjustment bolt at the base of the handle. Mine didn’t require a wrench, and I could adjust it by hand. I quickly had the new riving knife clamp properly adjusted. I also adjusted the height of the riving knife while I was at it. Mine was sitting at the same height as the blade, and it ought to be 1mm lower than the blade. To make a height adjustment, loosen the horizontal 5mm allen bolts that sit to the left of the riving knife clamp. The mechanism has interlocking teeth, so you can move it up or down incrementally. If you need to adjust the alignment of the riving knife to the blade, SLIGHTLY loosen the vertical bolts to the left of the riving knife clamp handle. Then you can set the riving knife in-line with the blade using a straightedge. From past experience with other saws and splitters (not true riving knives) I really don’t like the feeling of hanging up on a splitter / guard / or riving knife that is slightly too thick. At one time I used Microjig splitters. Occasionally they would completely bind in the cut. Once I tried to tip the workpiece out of the blade, and to my horror the entire zero clearance lifted off the saw while the blade was spinning. Just to be clear, that wasn’t a Sawstop brand saw. I don’t want to disrespect Microjig either, I’m just using that as a real-world example of what can happen when we get busy in the shop. Microjig makes some cool products, and having a splitter is probably better than nothing at all. Sawstop has really solved all of these issues for me. The throat plates lock down to prevent lifting up. On some of my inserts I had to use padded pliers to bend the metal tab on the underside. I like it when there is a good friction fit between the tabs and the cast iron support pads on the saw. This way I know that my dado insert will always be a flat, even reference surface. With the new 2.0 mm riving knife, I haven’t had any more hang-ups, and cut quality is still excellent. Feel free to chime in with your Sawstop tip. No tip here, but thanks for the info on the smaller riving knife. I wonder if they have a smaller guard holder as well… I’ll check. 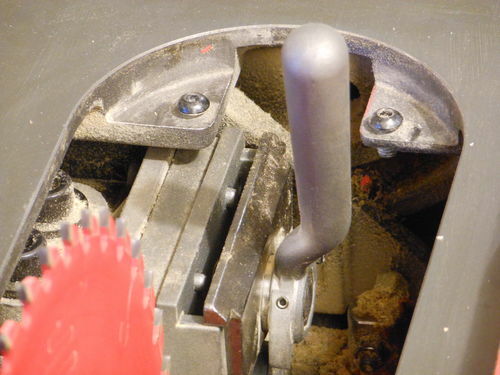 I have heard of users having issues switching back and forth from thin kerf to full kerf riving knives. 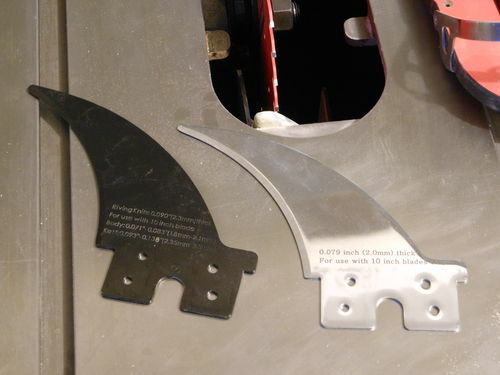 It may make your blade guard too loose or too tight in the clamp. I suppose you could adjust the clamp tension each time you change setups. Some have told me they used layers of tape or a business card to snug up the fit, but I wasn’t comfortable with that method. I just keep the thin kerf riving knife on all the time (except with the dado blade). I’ve had this issue of having the riving knife SEEM to cause an impingement on the workpiece. My thought has always been that, as a piece of wood is cut, tension is released and the wood actually, slightly bends away from the fence on the right and towards the blade on the left. That is, the newly-opened kerf in the wood pinches the blade. I use the same blade, with the chrome riving knife, which IS thinner than the blade. Nonetheless, it sometimes happens. I use my SawStop only occasionally, so, for me, it’s just a “comes with the territory” thing. Yes, I agree it is wood after all. Good straight lumber makes a difference too, especially if it’s freshly jointed stock. I like the fact that the 2.0 mm version gives just a little extra clearance, but still maintains the safety feature intended with a riving knife. Thanks for the info on the riving knife. I was having the same issue with my brand new freud fusion thin kerf on the standard riving knife and blade guard both where the wood would bind. In my case , 4/4 hard maple. Luckily, i was able to swap for a full kerf blade. But i will make sure to pass on that info. BTW, what was the cost of the thinner riving knife? Pricing for Sawstop accessories is really reasonable. I think the thin kerf riving knife was $15. Thanks Pinto. For those who buy a 1.75 PCS and want to run 220v, Saw stop makes a 220v contactor box that allows that. It is about $40 for the box and you need to contact SS for it. It is pretty much a plug and play. Unplug the cords, unbolt the existing box, reinstall the 220v version, plug in the cords and you are ready to go. Interesting. Are you running the 1.75hp on 240v? I would be interested if anyone has compared the saw before and after the contactor box. I’m running the 3hp, but I have heard from many users that the 1.75 has sufficient power too. Good blog, Willie—I’ll definitely watch this one. One thing I’ve learned from speaking with SawStop (they are very customer service oriented, and the technician I spoke with really took the time to answer my questions), is that Freud blades aren’t quite 10” diameter. They’re metric, and just ever so slightly smaller in diameter. I ran into an issue with my Freud FTB rip blade, as the brake system was giving me an error code (flashing lights) when I installed the Freud, after having set the brake for my thin-kerf 10” blade. Per the technician’s instructions, I just adjusted the brake a smidge closer to the blade, checked it with the yellow gauge, and everything ran smoothly there after. When swapping the blades back to my regular thin-kerf blade, I just readjusted the brake back a smidge, checked it with the yellow gauge, and have never had a problem since. Hope this helps anyone with a similar issue! I couldn’t find a thinner blade guard. I have several thin kerf blades from my Ridgid 4512, oh well. Pinto, I have the 3hp PCs and enjoy using it every timei can. I just wanted to pass on the contactor box information for the thread.